The new edition of this highly successful and popular textbook is a comprehensive, easy-to-follow guide to using and interpreting all the quantitative techniques that students will encounter in their later business and financial careers; from fundamental principles through to more advanced applications. Topics are explained in a clear, friendly step-by-step style, accompanied by examples, exercises and activities, making the text ideal for self-tuition or for the student with no experience or confidence in working with numbers. This highly successful learning-by-doing approach, coupled with the book's clear structure, will enable even the most maths-phobic student to understand these essential mathematical skills. 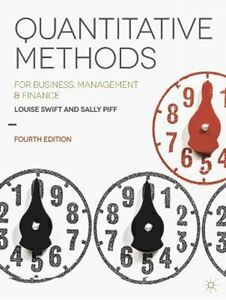 Comprehensive in both its scope of coverage and the range of abilities it caters for, this remains a core textbook for undergraduate students of business, management and finance, for whom Quantitative Methods modules will be a key component. It will also appeal to those on related MBA and postgraduate courses.